communications| Tucor Smart Irrigation from the Ground up. Tucor’s 2-wire control systems can interface and communicate via RealNet over Ethernet, Wi-Fi, and Cellular networks. Have an existing network? We’ll use it. Need a network? We’ll build it. 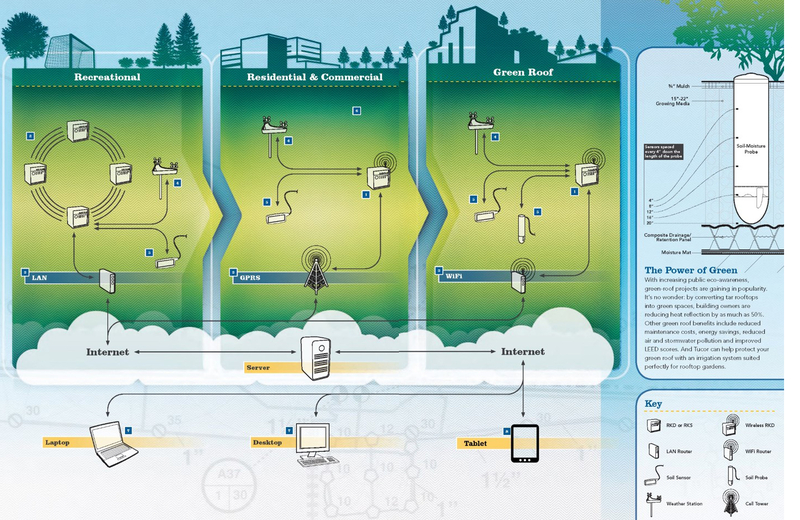 We can even combine different types of networks into one integrated system. Whatever your situation, we can most likely develop a networking solution that fits. Via the Tucor Web-based monitoring software called Cycle Manager linked on this sites home page, you can easily manage programs, manually turn on stations, set a rain delay, see real time flow, track alarms and review the entire network to spot any leaks, breaks or plugged nozzles from any internet connected computer or tablet. RealNet is the Tucor real time remote management system. Using any web browser or the Tucor mobile app you can connect to your TWI, RKD or RKS controller and change programs, view monitoring data, control irrigation…. etc.., Because this system connects in real time to the field controllers not a time delay server you can turn stations on and see real time flow. You can also use the J-Control feature to operate the controller face plate in real time making it easy to show operators how to make changes on the controller in real time.